A Spring Concert, gathering domestic and international music talents, will take place at the concert hall of the Vietnam National Academy of Music in Hanoi, on April 17 and 18. The Spring Concert will take place at the Vietnam National Academy of Music in Hanoi on April 17 and 18. The information was announced by the Vietnam National Academy of Music, on April 3. Accordingly, on April 17, artist Stephane Tran Ngoc will perform Beethoven's violin concerto Op.61, while artist Nguyen Viet Trung will play Mozart's Piano Concerto No.23. On April 18, international artist Eric Lu will perform Mozart’s Piano Concerto No. 20, while Kate Liu will perform Tchaikovsky's piano concerto No. 1 Op.23. The Hanoi Philharmonic Orchestra under the Vietnam National Academy of Music will perform together with the famous soloists in two shows. 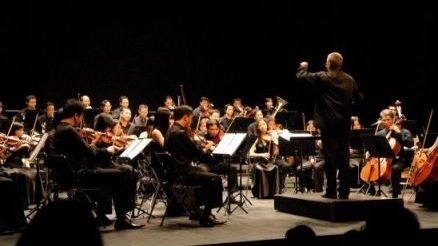 Under the baton of conductor Wojciech Czepiel, the Hanoi Philharmonic Orchestra is currently one of the leading symphony orchestras in Vietnam. The symphony orchestra has been produced successful performances in many countries around the world such as Russia, Japan and Thailand. Conductor Wojciech Czepiel, who is a prominent Polish musician and violinist, has been the artistic director and conductor of famous Polish orchestras and many orchestras around the world. The Spring Concert with the combination of Vietnamese and international music talents promises to bring a majestic music party to Hanoi classical music lovers.